Many of you know that the inspiration for the Sonoma County Literary Update came from Poetry Flash, Joyce Jenkins’s journal of Northern California and West Coast literary happenings, which is nothing short of a miraculous labor of love. A recent $600 rent increase for the Flash’s home has come at a time between essential grants, and contributions are needed to keep the Flash flashing until the grant monies come through. If you’ve ever had occasion to consult the Flash, either in its original print form or its current web-based format, please consider making a donation. It’s easy to do: just send check for any amount that suits your budget to Poetry Flash at 1450 Fourth Street, #4, Berkeley, California 94710, or use this link to make a Paypal contribution: http://poetryflash.org/give/. My co-editor, Jo-Anne Rosen, and I would love to share our post space with members of the Sonoma County Literary Community. If you’d like to take on a month’s full post or offer a “featurette” (150 words) about a writing group, reading venue, or upcoming event, please send your contribution along to me at tehret99@comcast.net. Kudos to Katherine Hastings on the publication of Digging Our Poetic Roots! 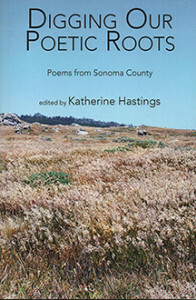 Saturday evening, a standing-room-only crowd gathered at the Sebastopol Center for the Arts to celebrate the culmination of Katherine Hastings’s poet laureate project anthology, Digging Our Poetic Roots — Poems from Sonoma County. Katherine gives a full report on her Poet Laureate’s News Page (https://socolitupdate.com/poet-laureates-news/). And if you missed this lively gathering, you have two more chances: Wednesday, September 16, 7:00 p.m., at the Cloverdale Performing Arts Center, and Thursday, October 15, 7:00 p.m., at the Healdsburg Center for the Arts. The Sonoma County Poet Laureate Selection Committee is seeking nominations for our 2016-18 Poet Laureate. Candidates must be residents of Sonoma County, whose poetry manifests a high degree of excellence, who have produced a critically acclaimed body of work, and who have demonstrated a commitment to the literary arts in Sonoma County. If you know someone you’d like to nominate, or if you’d like to be considered for this prestigious post, we welcome your nominations. Nominations must be received via email by October 31, 2015. If you have questions, contact Linda Galletta at the Sebastopol Center for the Arts: lindag@sebarts.org. I don’t know what the collective noun is for poets laureate—quiver? murmur? persuasion? clowder?—but whatever it is, you have a chance to hear three past laureates read at the Redwood Café on Sunday, September 6 from 5-7 PM. The evening event features Mike Tuggle and Gwynn O’Gara. 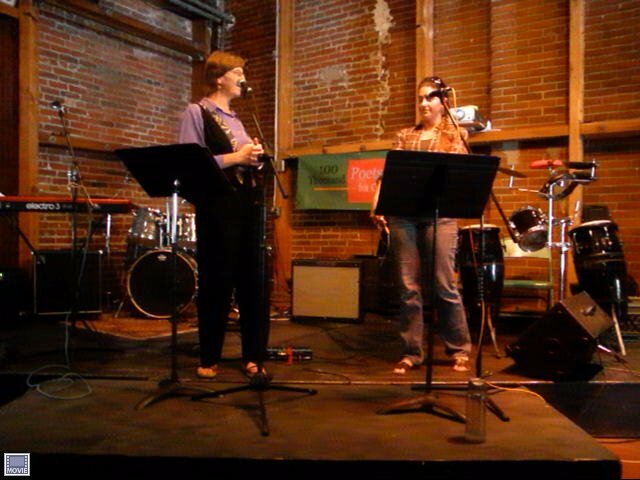 I’ll be the third, performing a poetry/music duet with my daughter Caitlin. Hope to see you there! Location: 8240 Old Redwood Highway, Cotati. 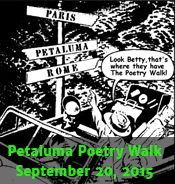 The 20th annual Watershed Poetry Festival takes place this year on Saturday, September 26, 2015 at Civic Center Park (MLK Jr. Way at Center Street, Berkeley). This FREE, day-long event features local and national poets, musicians, students, publishers and vendors. This year’s outstanding lineup of poets and writers includes former U.S. Poet Laureate Robert Hass, Brenda Hillman, Malcolm Margolin, Francisco X. Alarcón, and Novella Carpenter (Farm City: The Education of an Urban Farmer). Sixteen Rivers Press invites you all to join us on Saturday, October 17, to celebrate the sixteenth anniversary of our founding with a reading by Dean Young and Mathew Zapruder. Tickets are priced at four levels, beginning at $25, and proceeds will go to the support of Sixteen Rivers Press and the publication of our books. The event goes from 3 to 6 PM. Tickets will be available from Brown Paper Tickets on September 7. For a list of all the calendar events across the county and beyond, visit the Calendar Page: https://socolitupdate.com/current-calendar-of-literary-events/. Congratulations to local authors who have had their work published recently in books or journals. You can discover more on our Sonoma County in Print page (https://socolitupdate.com/sonoma-county-in-print). Special thanks to Ed Coletti, who keeps our announcements of local writers publishing in literary journals up to date.